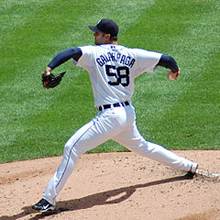 Armando Galarraga, pitcher for the Detroit Tigers baseball team, pitching on July 25, 2010. On June 2 of that year, Galarraga pitched 8 2/3 innings without allowing a hit — a near-perfect game. All he needed to complete a perfect game was one more out. But when umpire Jim Joyce incorrectly called the next batter, Jason Donald, safe on a close play, Galaragga was deprived of his perfect game. Perfect games are rare in baseball — until 2010, in the modern era of baseball (since 1900, when the rules stabilized), there had never been two perfect games in a single season. Other observers questioned the umpire's call, but the rules of baseball limit such questioning, and the call stood. Joyce later conceded that he had missed the call. Baseball is an example of a closed — or nearly closed — system. As in many professional sports, open disagreements with regard to officiating are limited, though there is variation from one sport to the next. Because the impact on society of lack of openness in sports is relatively minor, we can tolerate it. But the cost to society caused by closed social systems in organizational cultures can be severe when the organization is charged with responsibilities that are important to society. Examples are governments, corporations, commissions, foundations, and legislatures. Photo (cc) Arbitrarily0. Let her go for a while. Then comment, "Actually, I think there might be an update on that," or some other gentle way to offer a correction. If you answered (1), (2), or (3), you could be in trouble, because there's no right answer. The choice that works best — the least bad choice — depends on you, your boss, the other people in the conversation, and on your relationships. What works well in one situation doesn't necessarily work well in another. We'd all like to believe that a straightforward, honest, open offer to amend what the boss is saying should be acceptable. In a perfect world, it might be. But since most of us don't work in a perfect world, how can you tell what to do? Option (1) is an example of what works well in open systems. The straightforward, content-focused approaches work well when the relationships support them, when everyone is comfortable with that level of openness, and when everyone has agreed in advance to operate this way. Option (2) is an example of what can happen in closed systems, where safety is available only by exercising the utmost care. Systems in these configurations exact a high price in vigilance on the people who work within them. People must be constantly aware of a long list of behaviors that others regard as injurious or hurtful. The system suffers as a result. Effort that could otherwise be allocated to furthering organizational goals must instead be spent on attending to interpersonal wariness. The problem can become so severe that the system can actually become dysfunctional. it might be.is an example from a middle category between the open and closed systems. This category is the one most likely to apply to the typical work group. In these systems, some openness is possible, but the messages that are delivered so directly in open systems must be carefully encased in almost ritualized exteriors that communicate high levels of respect and care. These exterior messages are designed to make the recipient realize that the interior content is not a threat to the status of the recipient. Beware, though, because even the most tactfully delivered correction messages can trigger the backfire effect. Would you like to see your comments posted here? rbrenbeIoYRGvEEuydpNXner@ChacEjvNWCePGqmDaUjMoCanyon.comSend me your comments by email, or by Web form. I offer email and telephone coaching at both corporate and individual rates. Contact Rick for details at rbrenewnoYuugeJTgRoyiner@ChacZgfiBwugRTWafwakoCanyon.com or (650) 787-6475, or toll-free in the continental US at (866) 378-5470.